The last thing you need in your busy life is to fret over replacing a manhole cover that’s damaged, compromised or missing. The hassle of finding and installing a replacement, plus the fact that you may not be able to use your driveway as there’s a hole in it, all add to the stress. Below we’ve put together the key steps you need to follow for a swift, safe replacement with minimal effort and cost. 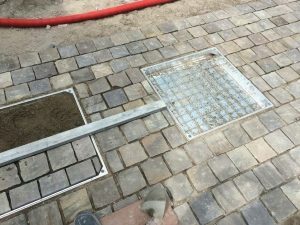 Unfortunately if there’s damage to a manhole cover then it’s prudent to replace the frame too as there’s no clear-cut way to ensure the frame is sound. Does your manhole cover have an inspection chamber underneath it? If it does then you’ll need to measure the diameter of the circular chamber (these chambers are almost always covered with a circular manhole cover) and pick a manhole cover and frame which matches this. Double-check that the cover and frame you choose is compatible with all major inspection chamber brands, and make sure it’s still the correct load class. As explained in our guide to manhole load classes, each of the classes denotes the maximum weight that the manhole is able to safely take. For example, if the manhole cover is going to be installed in a private driveway, you could safely assume B125 would be a high enough load capacity. This allows for up to 12.5 tonnes of loading which should satisfy 4x4s and vans on a domestic driveway. It’s at your discretion to decide what you need, but our advisers give recommendations daily so it’s worth asking. 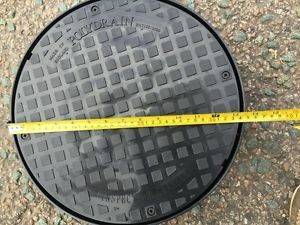 Once you know what size and load class you’re after, it’s up to you to select which metal you want your manhole cover replacement to be made from. In the table below it’s outlined the benefits of each of the materials. Cast Iron Black in colour so best to blend in to tarmac, cast iron is the strongest material of the four, rated up to 90 tonnes Suited to all areas but overkill in lightly trafficked or pedestrian areas. Cast iron manhole covers are allowed on highways and roads. Aside from the load class implications, and whether you want a recessed manhole or not, the material is really a personal decision for you to make. We’re on hand to advise though should you need us. Contact us on 01752 692 221 for help replacing your manhole cover.